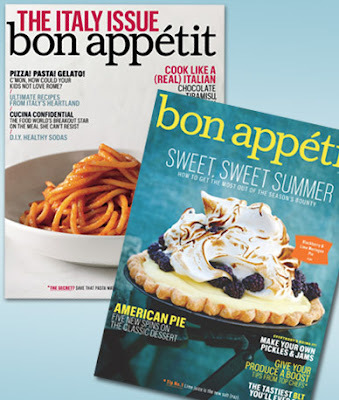 BTW, my husband and I made some terrific new recipes for our anniversary dinner on Sunday night: a barbecue shrimp recipe from Emeril with the most amazing sauce and "Utterly Deadly Pecan Pie" from Southern Living. Both were fantastic! I'm not really a "nut pie" person, prefer fruit pies, but this pie made me a believer! :) Will have to share those with you soon, too! How could I forget Carolyn gave me all this beautiful Flower Soft?? I was so excited to make some snowy cards then, and now the holidays are finally on their way! I used just a little bit of Mono Multi to make a little pile of snow under the stamped "Holiday Basket". The flowers are colored, cut out, and popped up over the basket. I used Y28 Lionet Gold for the basket (in layers to make the edges darker), R39 and R52 for the poinsettias, E37 and E31 for the pine cones and G21 and G99 for the needles. I added just a few dots onto the needles and flowers to add more snow. Cardstock is Gina K Pure Luxury Ivory and Fresh Asparagus, greeting is from "Celebrate the Season". Here is a closeup. 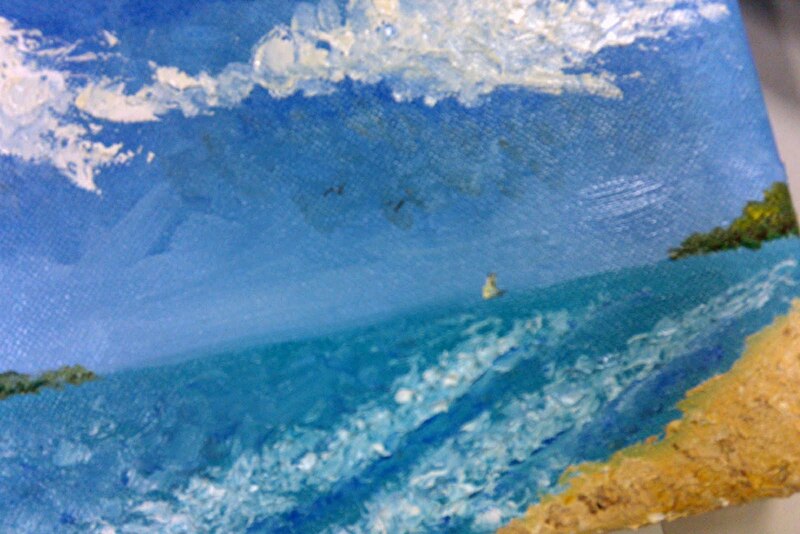 The teacher had just the teeniest hint of a mast on the horizon in her painting so I added a little sail and two birds to mine. These little details are SO small, but it's probably my favorite part of the painting because it draws you in to check them out. Not crazy about how bright the colors came out, but it was my first time to mix oil paints, amazing how many different colors you add to create a more muted tone. I preferred the finished work of most of the other students to my own, but it seemed like that was how most people felt, preferring someone else's work to what they were doing. 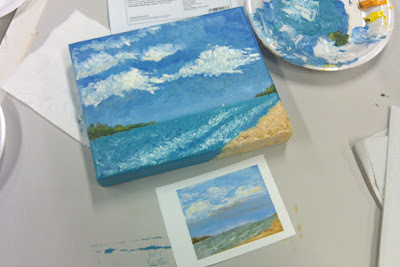 Although a few women said they'd done a few ladies nights there before, I think most had little to no experience painting, so I feel pretty comfortable saying anyone could do a very fair job of this their first time with the instructor going step by step. 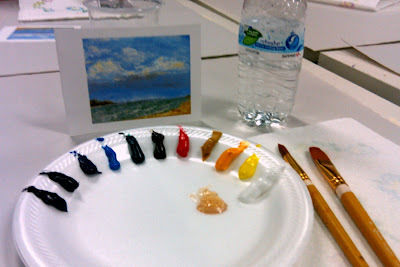 I'd been told before (by painters) you don't need to be able to draw to paint, and while it certainly helps to be comfortable with seeing colors and shapes, now that I've done it, I believe that to be pretty true. Everyone seemed to like the texture I got on my waves and how impressionistic the clouds looked. (Impressionism has always been one of my favorite painting styles) Because it's still drying flat, I haven't been able to hang it up and view it from a distance for a different perspective. Just wanted to share. 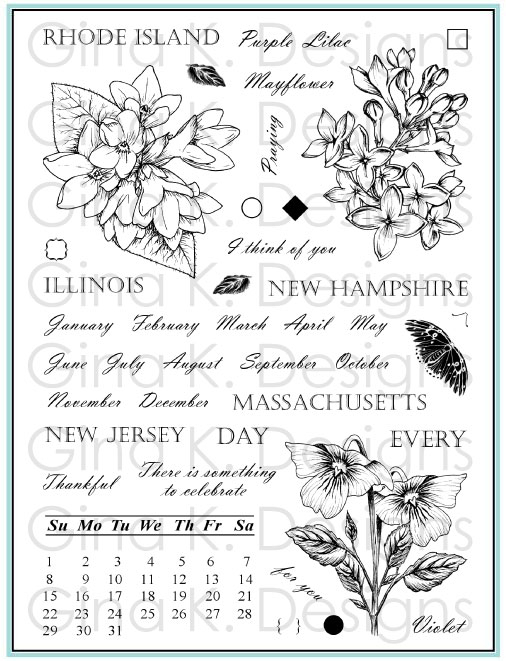 (I finished SEVEN new stamp sets this week, which of course I cannot yet share, but squeal, you will like! So I've really been getting my "draw" on!) Try something new this week! Expand yourself and your experience! I punched out one of the holes for my greeting: to do this, flip your punch over and line up the circle over the round image and punch. 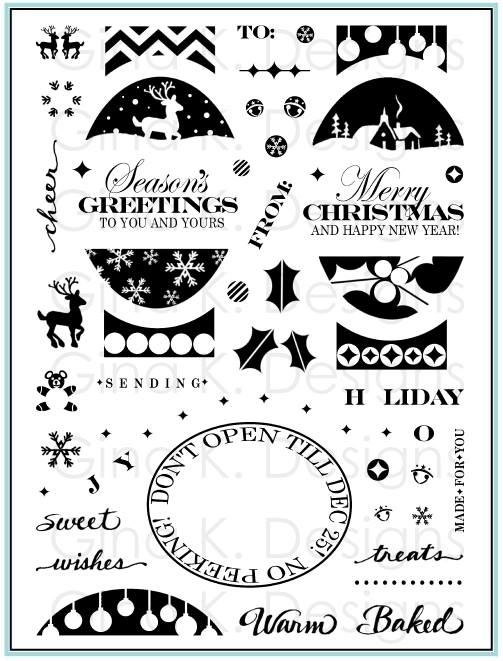 Then lay your punched mat over your white mat, ink up just the "love" from one of the long greetings in "Holiday Basket" with a Memento Bamboo Leaves and stamp into the hole. Pop up the stamped paper using foam dots over the White and then adhere to the Pure Luxury Fresh Asparagus card base. Good morning! Here is a sample using "Holiday Basket" and flowers from "Buds and Vases". Cardstock is Pure Luxury Just Peachy, Grass Green, and White with Basic Grey Nook and Pantry on the side and some yellow 5/8" gingham. I used most of the same markers from this basket tutorial post, adding the deeper orange color (E07) inside the flowers (Flesh Pink E95). See how different this white basket looks? To make it stand out from the white background, just add shadows to the edges with W-3 and E51. I stamped the flower bunch first, covered with the mask, then stamped the basket. Then I stamped a single flower on either side, removed the mask and then stamped and cut out three separate flowers to pop up over the image to make a fuller arrangement and add dimension. In the photo below I outlined the areas where I added shadows on the sides of the basket and under the masked flowers. Hope this is helpful in showing how options for adding to the basket are unlimited! Hmm, which set to try with it next? ;) Thank you for visiting today, I appreciate your feedback! Here is a new "Holiday Basket" I did inspired by a photo of a fall basket online that had the different strips stained in gorgeous fall colors! I used E07 for the brick colored vertical strips and YG91 Putty and W-3 on two rows of the horizontal and E13 on the other two. Just alternate between strips to make the pattern consistent. The I used the same reddish brown and beiges on the puppies. Cardstock is Pure Luxury Kraft, Lipstick Red, and White. I used Basic Grey Manila for the sentiment tag and paper piecing the liner of the basket (that and the dogs are from "Basket Buddies") Use some W-3 on either side of the patterned paper to add dimension to the piecing. Greeting is from "Basket Blessings", I thought that went so sweetly with the puppies and flowers. The blessings make it a nice card for Fall/Thanksgiving. :) These two sunflowers are trimmed out of the flower bunch in "Holiday Basket" and popped up on foam dots. I pierced a row of dots with my Scor-Bug and Scor-Buddy at the top and bottom, across the wonky layers, and added some Taupe May Arts silk ribbon that matches the Kraft, making a nice bow with the Bow Easy (secured with a glue dot). Good morning! It's time for that "Holiday Basket" coloring tutorial I promised for my favorite card from the release! I said during the party I thought I used 6 or 7 colors, turns out it was 8 (BUT, I could have done it in 7, two of the markers are almost the exact shade and I only only noticed I used a different one when I looked at my photos that I grabbed a different marker) It looks like more colors though because I add my color in layers to create darker shades rather than separate markers for each, and you can really change the shade of one marker using a gray tone like W-3 over it...so let's begin! First stamp your basket in brown on White Pure Luxury. (While I ended up using warm tones and Ivory cardstock on the card underneath it, the colors of your markers will be a lot truer when you start with white, and I will be adding warmth to the mat at the end with the distressing inks.) Stamp it on scratch paper and cut out to have a mask you can keep, you will use this mask a lot! 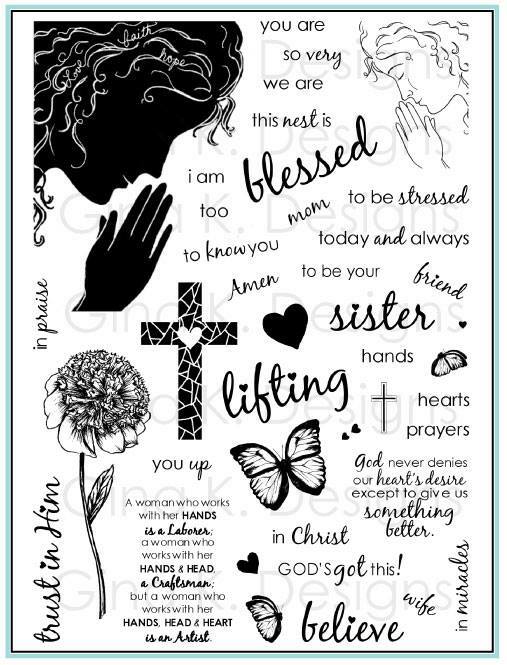 Place it over your stamped cardstock. Stamp the roses directly over it in brown. Remove your mask. Ta da, the roses are in! I love masking! So I usually start by filling in my entire image with the lightest color, that's what I did here with E53 Raw Silk. This is a nice deep ivory color, it works great for skin, but also for light woodwork. Then I filled in the wider horizontal strips with E57 Light Walnut. See the braid across the top and bottom? Did I fill in each little "bubble" separately? Nope, just one careful line straight across with the brush tip, easy peasy! Now I am adding a second layer with the same marker to shade the edges to each strip, the hump in the middle should be the lightest where the light hits. All you have to do is go over the lines I have already drawn in the the image to give the basket shade and texture just start at the edge and pull out toward the middle in quick flicks. Do this on both sides of each brown strip, it goes quickly. Now do the same on the vertical strips on the top and bottom with E31 Brick Beige. Also go over the far left and right sides of the basket. (In this case I chose a darker shade for shadows because the lighter Copic shades do not deepen as much when you layer them as the darker ones do like the brown above. The beige can also act as a blender if you want to go over the darker areas of the dark brown ones to blend the lines just a little. Then take the W-3 and do the left and right sides and the handle, concentrating on the ends and creating streaks to give texture and the appearance of wood grain. Now for the leaves. Color over the whole leaf with a light green like G21. Then go over the middle sections and portions that are tucked under a rose with a darker green like YG03. Next I went over all the roses with E51 Milky White (also a flesh tone). This color is so close to Raw Silk, just a little paler, either would have worked...) (BTW, the holes on the top look darker because I pierced through them for the handles) Then I added W-3 to the undersides of the petals and areas near the center of each rose. I do thin really quickly, just adding strokes and basically tracing around things, it doesn't have to be perfect (I know you might be thinking "Ack! Gray on a ROSE?!" But it will be okay, it really will! You need to have some dark areas and a warm gray like this is going to look just perfect, especially with that paper, wait and see... :) I forgot to take picture but I also went over the leaves just a bit with this gray to tone down the brightness of the greens to make them a little more muted, you'll see the difference in the next photo. And here is the finished card. Add warmth to the mat with distressing ink, starting with the light ones (Antique Linen, Tattered Rose)and then gradually adding dark Vintage Photo until you have the desired look. I kept holding my basket mat up to the patterned paper in between sponging more on until I felt I had it right. TIP: I didn't bother to mask the basket when I did my sponging because I didn't want to go all the way up to my image, instead wanted to have a little white showing for more contrast between the sponging. One last thing I did was use my W-3 to add a shadow (just a line) under each handle and then a small "puddle" of shadow below the basket. Hope you can tell from these photos it was EASY to do, no tricky techniques involved! Good grief this is my longest post in awhile, I hope it was helpful! I like doing them but they take a lot more time, so if you like this and want more, please let me know in your comments, thanks! More overflowing baskets and coloring to come! Have a great weekend! Inspiration Hop, Day 3: "My True Love Gave to Me" and "Cool Beans"
Hello, and welcome to day 3 of our September inspiration hop! 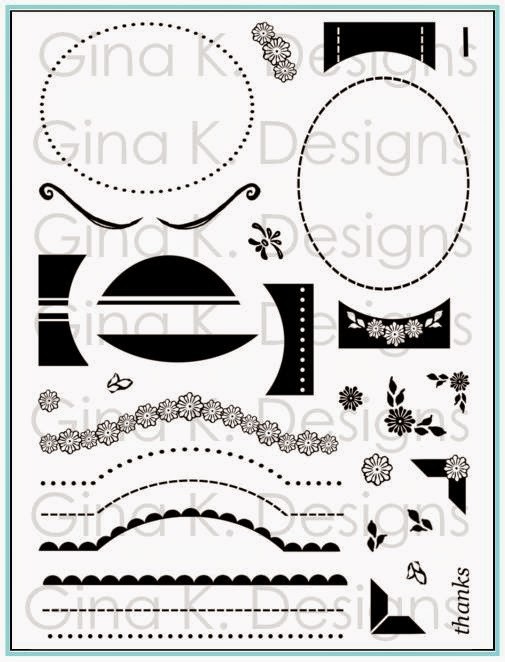 Today we have two more fabulous sets from Gina K Designs! The first is the adorable "My True Love Gave to Me", with sentiments from the classic Christmas song and lots of cute, CUTE birdies! I decided to start with the first day (but I know I will be inking them all!) 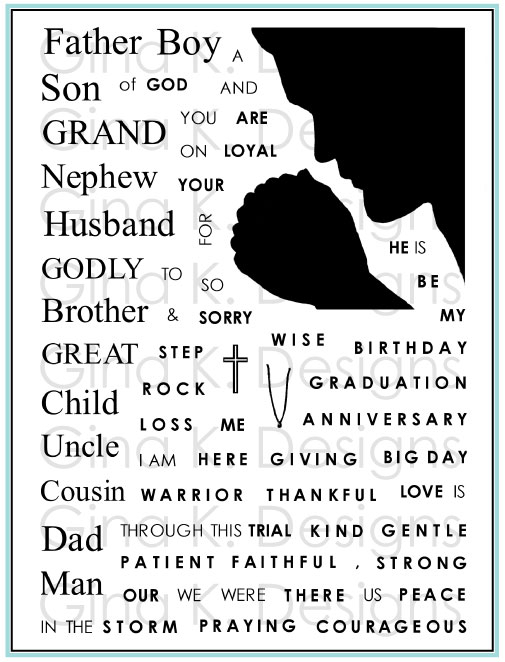 Here is a pretty simple card to mass produce, two layers, but with a few extra touches that make it special! I stamped the sentiment and image in Forest Green Distressing Ink and added the one in Fired Brick, you can really make the number pop using a different color (and it's nice and easy because the numbers are separate stamps so you can fill in whichever you need.) then I colored the image with Copics (E07, E13, and E97 for the pot, E13, E47, and E57 for the trunk, and YG00, YG 11,Yg93 for the pears, YG 63 and BG96 for the leaves, and B95, E07, W-3, E47 and E57 for the bird, I actually had to Google "partridge" to figure out some good colors, LOL!) Then I added just a touch of gold Sakura glitter pen to each pear. Next up we have one of the cutest "Free with Three" sets evah!! It's "Cool Beans"! I decided to paper piece the little coffee cup in three different Echo Park "Walk in the Park" prints and colored the coffee, beans ( E13 and E57) and spoon (W-3) with Copics. Tip: Don't forget to add a little shading with the W-3 over your paper piecing to make it more dimensional! 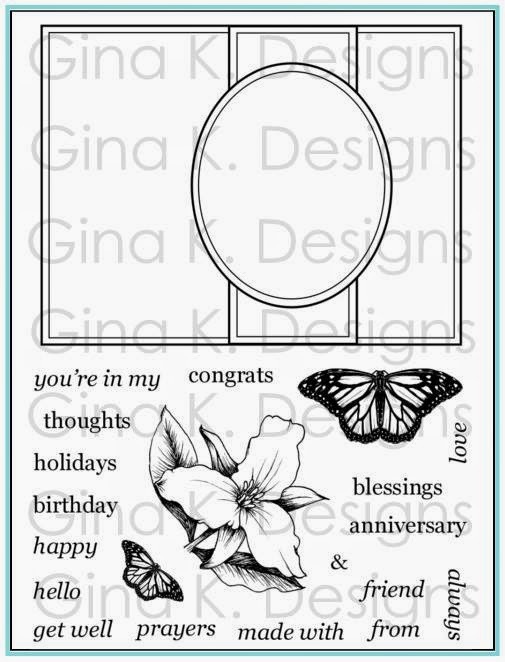 Enjoy hopping with the rest of the team, don't forget to leave comments all along the way for chances to win a free set of your choice from Gina K Designs, the more comments you leave the more chances you have to win! 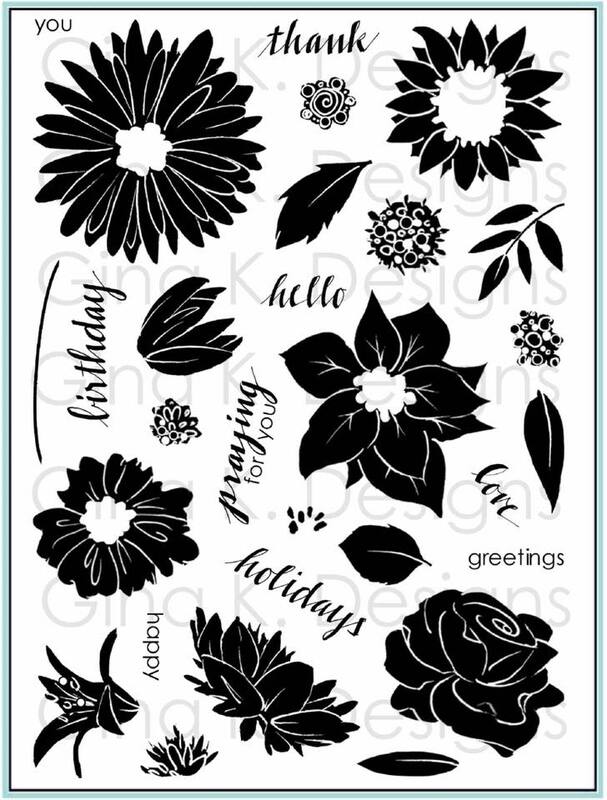 Inspiration Hop, Day 2: "Celebrate the Season" and "Home Is"
Welcome to day 2 of our Inspiration Hop with the Gina K Designs team! Our first set today is Theresa Momber's "Celebrate the Season". This set has nature elements for almost every occasion, I had to start with this beautiful branch and some berries for clean and simple, but easy and elegant, Christmas card you can mass produce, with very minimal supplies! :) I used two markers, Memento Rich Cocoa for the branches and Rich Cocoa and Lady Bug for the berry bunches and the sentiment. TIP: Ink with the red first and add the brown second before stamping to avoid getting the tip of the red muddy. Then I added some Sakura Glaze pen over the berries for dimension, Star Dust Stickles for heaps of frost in the curves of the branches, and a single rhinestone to emphasize the sentiment. 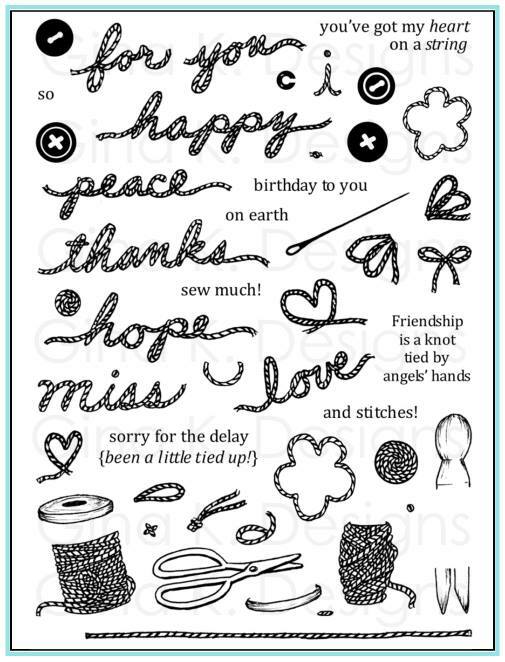 All three of these "embellishments" are very inexpensive and give you a lot of mileage and pizazz on your holiday cards! The next set we have today is "Home Is" from Tami Mayberry, honoring all things home and filled with greetings and images to for welcome, we've moved cards, invitations, etc. I'm sure you will see lots of card using the house today, but when I first saw this sun I immediately thought of the little medallions I saw in a paper flower making set and decided to make a few of my own. :) I stamped the sun three times onto Echo Park "Walk in the Park" paper , added a little Copic orange, and punched them out with a 1" circle punch. Next I cut some long stripes on DP about 1 inch wide with decorative scissors and pleated. I attached the ends together with Scor-Tape to form a tube and pulled out the edges to flatten it. Next I cut some long stripes on DP about 1 inch wide with decorative scissors and pleated. I attached the ends together with Scor-Tape to form a tube and pulled out the edges to flatten it. I put a large piece of adhesive foam on the back to hold it together and on top to hold down the punched sun. I left out the petal part from the third sun to go with the "Missing you". Card base is Pure Luxury Sweet Mango. 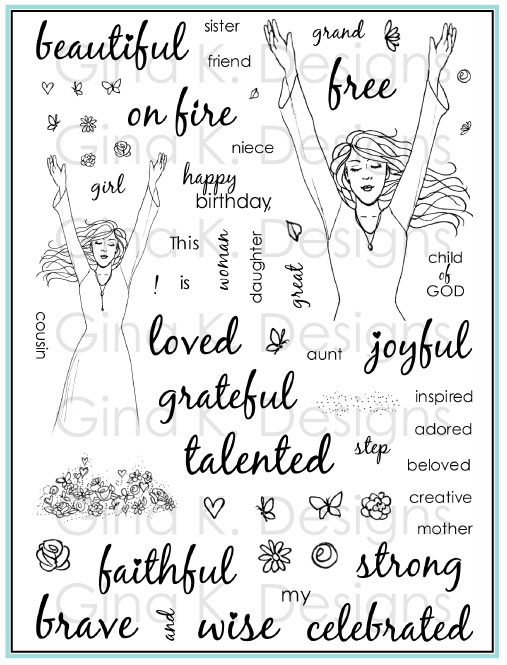 Enjoy hopping with the rest of the team, don't forget to leave comments all along the way for chances to win a free set of your choice from Gina K Designs, the more comments you leave, the more chances you have to win! Inspiration Hop, Day 1: "Holiday Basket" and "Under the Weather"
Welcome to day 1 of our Inspiration Hop with the new sets, I hope you had a GREAT time at the release party last night! I am so excited to tell you about my new "Holiday Basket" set! This Longaberger style basket, flower bunches and petite version of three of the flowers and leaf elements from the "A Year of Flowers" set coordinate with "Spring Basket", "Basket Buddies" and "Basket Blessings", you will love mixing all these images! Of course all these new images will fit in the other basket and vice versa. Additionally, these work beautifully with all my other hand drawn nature sets. 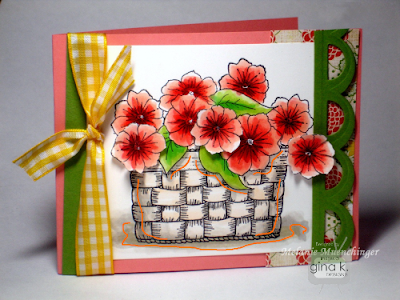 The first card I am sharing today uses the basket and bunch of roses. First I stamped the basket, covered it with a mask, and then stamped the roses in Memento Rich Cocoa. Remove the mask and color! three are SO many ways to color this basket, here I created a two tone look to emphasize the warp and weft of the weave (I will be back with step by step Copic photos of how I colored it after our hops, still need to upload the photos) My inspiration was this gorgeous DP from the Basic Grey Curio pack (I tore the edge to add some texture like the curling rose petals). Stamp the handle twice, cut out and attach with brads. Edges are sponged with Antique Linen, Tattered Rose and Vintage Photo Distressing Inks. Cardstock is Pure Luxury White, Ivory, and Black Onyx. 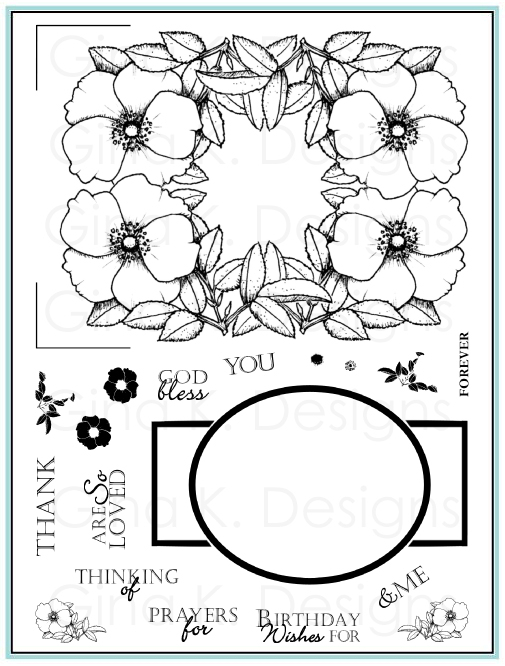 I traced the embossed border with a Sakura Stardust pen as tracing a few parts of the image to the flowers and added a 3 mm pearl to the center of each. Finally I have the card I shared yesterday, I realized I didn't give you details about how I made it! Originally I colored the basket and flowers, but then decided I really wanted that pumpkin cardstock I used on the die cut mat to "pop", so I paper pieced over it, stamping it in brown and no shading. I think it looks really rich without any coloring! Flowers and handles are popped up for dimension. Next we have "Under the Weather" by Rupa Shevde, an adorable set of images and greetings perfect for sending get well wishes! I used this little teddy with his arm in a sling and paper pieced his bandages with Echo Park "Walk in the Park" DP. I added just a touch of shading with Copics B00, B000 and R83 for the ears. I used some scraps of the polka dot paper to make my own "bandage" since I didn't have any coordinating ribbon, and free cut a little heart from Lipstick Red Pure Luxury CS to match the mat. I added a button and hemp (see it, XO?? get it?) and a little heart brad secures the sentiment pennant. Card base is Pure Luxury Bubblegum Pink. Enjoy hopping with the rest of the team, and don't forget to leave comments all along the way for chances to win a free set of your choice from Gina K Designs, the more comments you leave the more chances you have to win! If you came from the lovely Lee Murphy's blog, you're at the right place. If not make sure to head over to StampTV (link to StampTV's main forum) where you will find a list of all those participating in today's hop. 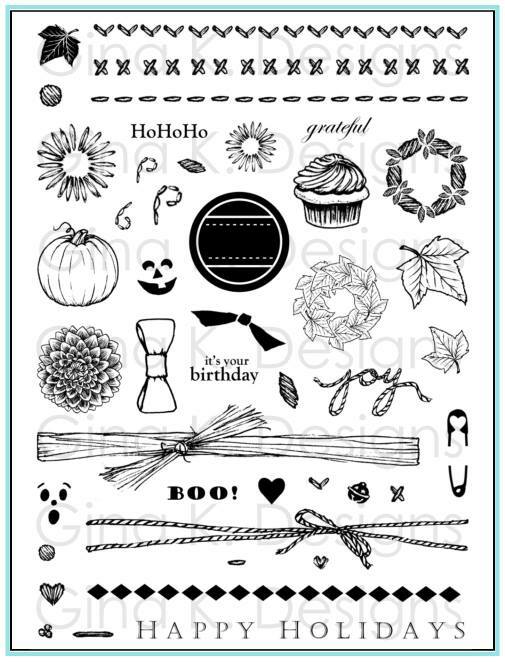 Here's a photo of one of the cards I will be sharing at the party, using my newest set "Holiday Basket". Just a peek at what one thing you can put in this new basket, this coordinates with so many of my previous sets! Head on over to the marvelous Michelle Woerner's blog to see what she's sharing with you today and see you back here tomorrow for the beginning of our three day Inspiration Blog Hop series for September! PS You want to know who won my blog candy? Well! I'm not even sure what the "correct" answer is to the question how many of my previous sets coordinate with this new "Holiday Basket set, there are many right answers you could easily justify! Sorry for the lack of posts, we have had a lot going on this week and I have been stamping my hand off getting ready for our next release! Thank you all SO much for your prayers for the fires, everyone I knew personally who had to evacuate returned to their homes, which were untouched, praise the Lord! One of which was Donna Baker and her husband, I am so, so thankful their house made it. Please continue to pray for all the families who are in need and that Texas gets some rain SOON, and if you can, support local businesses and organizations who are contributing to the relief effort. I don't have any cards I can share today, so how about some blog candy. Hope you all got a chance to check out Gina's sneak peek here, you can get a chance to win this new set by leaving a comment below with your guess of how many of my pasts sets it coordinates with. (You cans see all my sets here to help with your answer! I will announce a winner on Tuesday morning during our design team blog hop when we share cards using the new sets and have info about the release party that night. Wherever you live, you may have seen the catastrophic fires that are raging here in Central Texas, please please pray for the safety of all the families and first responders affected by this. Bastrop Cedar Creek, Steiner Ranch and Leander are all within close proximity of where I live, to the West, East and North. We have no rain in the forecast for the next week, this is the worst drought we've had in 50 years and more than 25,000 acres have been destroyed and over 500 homes have been completely destroyed. 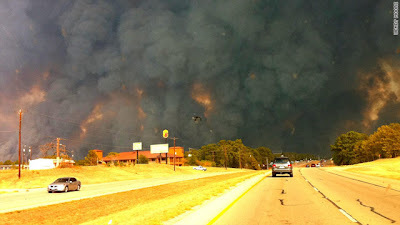 (Over 3 million acres have been burned across Texas already!) Please pray for miracles and RAIN! As of last night there was ZERO containment of this fire. Thankfully, there has been very little loss of life as most have been evacuated, the fire is so bad though that they can't even fight it on the ground, dumping water with planes and helicopters. If you feel led to, please consider a donation to the American Red Cross or The Salvation Army 9you can specify a city/state for it to go to), or, if you live nearby donate supplies for those who've lost everything or are evacuated and still waiting to find out about their homes. I have friends in ALL these areas who have been evacuated waiting to find out if they will have anything to go back to, I am on pins and needles waiting to hear. They are collecting these supplies today at the Diocese of Austin, you can find a list of what they need in the supplies link above. There are also several churches in the area that are helping collect and transport items all week, you can find a convenient location online. It only took a few minutes to go through our home room by room and collect travel size hotel toiletries, clothes, books, toys and blankets and I am just so thankful we can do something in addition to praying and hoping, that all these small things will help people who are desperately in need! If YOU have been affected by this, I AM praying for you!! 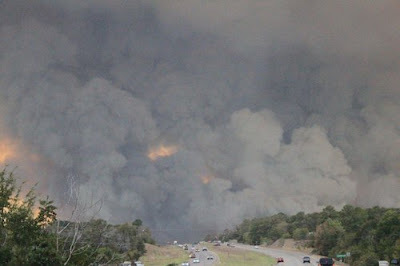 PS These are not my photos, found online to show you how bad things are, not sure who took them, but you can see news footage and more photos by Googling "Bastrop fires. I thought for a moment I could just get a blank book and do this myself, but I've been saying that for years! A couple years ago a friend told me she she couldn't' stay on top of a scrapbook she'd started a journal where she'd write something she about her son that day, i thought it was a terrific idea, but with it blank you might end up feeling like yo need to write a really long entry. I got these because I can always find something new or different or worthy of commenting on about my children each day and it's important that they know it and important that I focus on those good things instead of any negatives. Same goes for my husband. It will help me remember all the most important and blessed little things that they do as well as build up their self esteem. 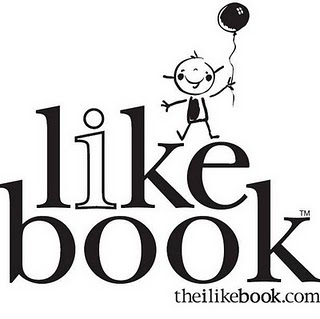 I also read through the reviews on other mom sites of the product before buying and they ALL had such great things to say about it, that their children loved it reading it or doing it together (there is place for the child or spouse to respond and write something back to you if you want to do it that way), even older kids. I think it will be a wonderful way to connect with my husband when our schedules are so busy sometimes to have many opportunities to focus on each other. I am excited about having this and will probably be sharing some of the things here "i like". Have a wonderful, safe holiday weekend! Are you ready for another fun, furry project from Kyra and the "Basket Buddies"? Today she came up with this adorable gift card holder, I love this idea to help a friend or family welcome their newest member(s!) of the family with a gift card to the pet or book store to get any little extras you might need for fun times ahead! Kyra's detials are below! My sister-in-law just received a boxer puppy, and I thought it would be fun to get some things just for Lucy. However, I didn't know exactly what she would need. Perfect time for a gift card! 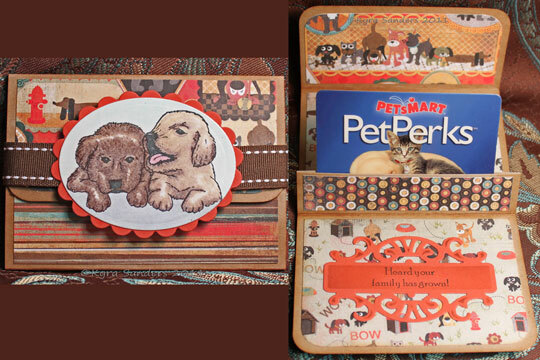 I used Gina's gift card tutorial ( and this video shows the second part) from Stamp TV using pure luxury Kraft cardstock, and Basic Grey's Max and Whiskers paper. Before I adhered the patterned paper, I inked up all the edges with vintage photo distress ink. I stamped the puppies from "Basket Buddies" on white pure luxury heavy base weight paper, and colored them with my Prismacolor pencils, blending with odorless mineral spirits. I gave them just a hint of a background using my Copic markers. I cut the Oval and Scalloped Oval using Spellbinder's Nestabilities. I stamped the growing family sentiment on coordinating cardstock, and used my Spellbinder's Fancy Tags #3 die to cut it. From there, it was easy to adhere all the pieces, cut and make a loop with Gina K's wonderful stitched ribbon, and attach the oval image. By now I am sure you have all read the news about Theresa's little Pebbles. :( I never dreamed when I was drawing the "Basket Buddies" set (9 months ago!) I'd need a pet sympathy card so soon after we released it, but I'm really glad to have it, as I worked on the card I thought all about Theresa' story about Pebbles, as well as other pets my friends and family and I have loved and lost over over the years, and it's so much more personal than sending a card with other images or sentiment intended for "humans". I copied the photo she posted to her blog of Pebbles, I assume it's a favorite (since I took it for the purpose of sending this to Theresa only, I'm hoping it was okay to lift it!) I cropped it into an oval and softened the edges with my photo editing program, then printed it on Pure Luxury Ivory. I put a layer of vellum over it (I couldn't find anyway to attach it that I liked from the front, brads took away from the portrait) by folding the top and securing it to the back with Scor-Tape. I stamped the little paw and sentiment at the bottom. Then I made a little Best Friend tag for the bottom. (You may have noticed I provided a frame image almost identical to this silver one in the set, which is a nice option for different colors or if you don't have any metal tags, but I had a couple left in my stash.) You can make the greeting say "Best Friend" by inking with a marker and omitting the "s"; being able to make the "Best Friends" singular or plural is very nice for when you want to caption a single portrait OR a picture of two pets together or a pet and their owner. Sentiment is stamped on Tan Leather and attached with brads to hold the vellum down. Finally I mounted it all on Pure Luxury Bubblegum Pink to match that cute little bandana Pebbles is wearing and Black Onyx. I lined the inside with Ivory to match the front so I could write my letter. 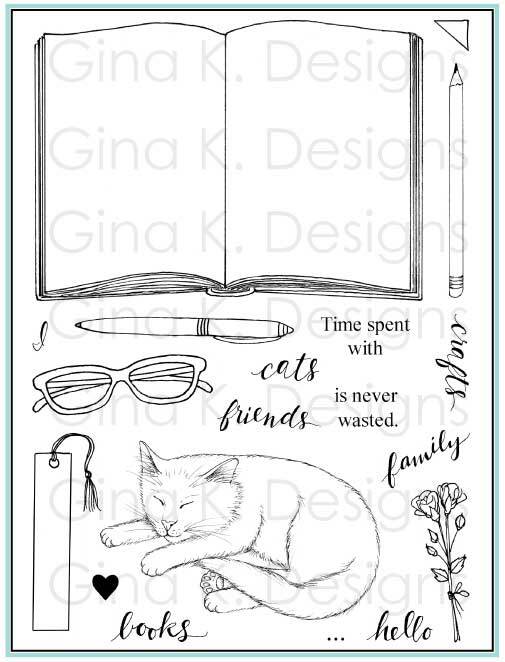 If you don't have a photo of that pet for a pet sympathy, you can use just the paw print, pet silhouette (with or without the little cloud) or stamp just the line art image behind the vellum. Whatever you choose, the card is sure to be appreciated and you'll have a good experience making it, thinking about all the wonderful things animals add to our lives.